Tesla offers a number of streaming services, which vary depending on what region the car was sold and options selected. Some services have offered options for improved quality in the past. SiriusXM – A North American satellite based music and audio service. Offered as part of the Ultra High Fidelity Sound package on current cars that have a pano roof. A paid subscription is required for this service. The system provides each channel with a bitrate between 4 and 64 Kbps, in 4 Kbps increments. XM uses their own compression technique, possibly better than MP3 at the same bitrate. Slacker – The streaming music source Tesla vehicles in for North America. Tesla provides a Slacker Plus account to all owners. This is better than Slacker free, as it allows song selection and is commercial free. 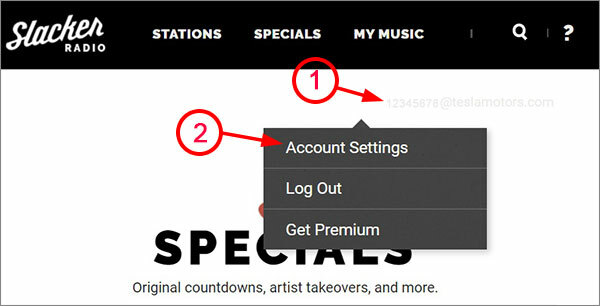 Slacker offers Premium upgrade for a monthly fee, which allows repeating tracks and building a playlist. It used to be you in the car’s settings you could up the bitrate to 160 Kbps if you had UHFS.This option was removed in July-2017. Now for UHFS owners, you set this from within your Slacker account. First contact Tesla (use the Tesla Contact link) and ask for your specific Slacker account and password. Once you have that in hand, using a PC or Mac browser (not a phone) you can login to your Slacker account..
After login, near the right top is a very light gray account that looks similar to “12345678@teslamotors.com”. It almost disappears on the white background. Left click on this and select “Account Settings”. Then click on the “General Settings”. 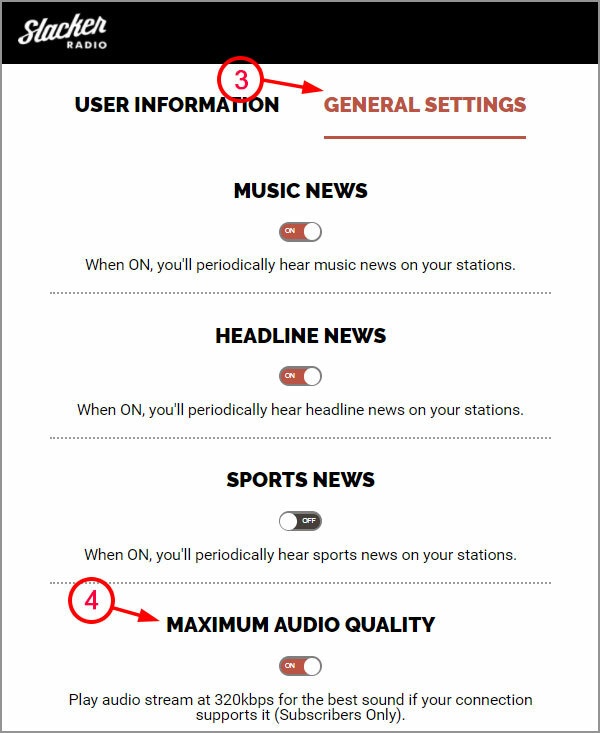 About four settings down is “Maximum Audio Quality”. Toggle this to “ON”. It indicates the sound will play at 320 kbps, but in the past it is actually limited to 160 kbps (which is still better than the 128 kbps default). There is still some question if it really boosts the bitrate to 160 kbps and/or if limited to those with UHFS, as it has in the past. Tunein – Streaming of various radio and internet stations for North America. It’s unclear what the maximum bit rate in the Tesla is, but technically Tunein can range from 48 Kbps to 320 Kbps. The bitrate depends primarily on the connection bandwidth and the source station. DAB/DAB+ – Digital Audio Broadcasting can be sent via a satellite service or via a terrestrial transmission. DAB/DAB+ is now standard, but in older cars, it was only included in cars that have the Sound Studio/Ultra High Fidelity Sound package. The service is available in select areas including Australia, much of Europe, Hong Kong and South Korea. DAB uses an older compression standard that requires about twice the bitrate over the newer DAB+ service for similar sound quality. The system has a maximum bitrate of about 1,184 Kbps for a station. Most stations are between 48 Kbps and 192 Kbps. RDIO – Tesla was the first automaker to integrate RDIO into a car. The company that owns this service shut it down in December 2015. Tesla replaced the service with Spotify. Spotify – As the current internet streaming music source outside North America, it became available at the end of December 2015 with a software update. Spotify indicates they offer three bitrates – normal at 96 Kbps, high at 160 Kbps and Extreme at 320 Kbps. While unconfirmed, we suspect it is similar to Slacker, where it is limited to 128 kbps. Only Slacker (in Northern America) and Spotify (elsewhere) are currently available on the Tesla. That might change this week with the 8.1 release, but there have been no rumors of any streaming changes. You can have Tidal on your cell phone and connect audio via Bluetooth to the car.